Whereas the worldwide media on is clearly on the side of his leftwing opponent Mr. Fernando Haddad and have dubbed this election one of “a fight for democracy and against Fascism,” (as a former candidate Mr. Ciro Gomes stated), Mr. Jair Bolsonaro sees it differently. Mr. Bolsonaro, who has already offered his party a larger than ever vote share in the parliament, hopes to offer Brazil ’s battered economy a renewed way. His son and campaign adviser Mr. Eduardo Bolsonaro said in an interview to Bloomberg that as "Brazil is a crashing plane, we will be daring." The rightwing evangelical says that he plans to reform pension spending and simplify an unwieldy tax system that stifles economic growth. The son of the senator says that Brazil could face dire results if the policies of the leftwing PT are not changed, stating: "If we can’t alter the constitution by amendment, the country will suffer the consequences, it will turn into a Greece." Although markets estimate Mr. Bolsonaro’s chances to stand at 70% of winning the presidency on Sunday 28 October, political analysts claim he still has some bridges to build in order to win the support of the remaining candidates. Third-place candidate, center-left veteran Mr. Ciro Gomes already said that he would throw his support behind the PT’s Mr. Haddad in the second-round runoff, but even with that Mr. Bolsonaro is still expected to win. Analysts are now looking towards the more-market friendly Mr. Geraldo Alckmin, who finished fourth, with 4.8 percent of the vote, representing slightly more than five million people, and to see where he will side. 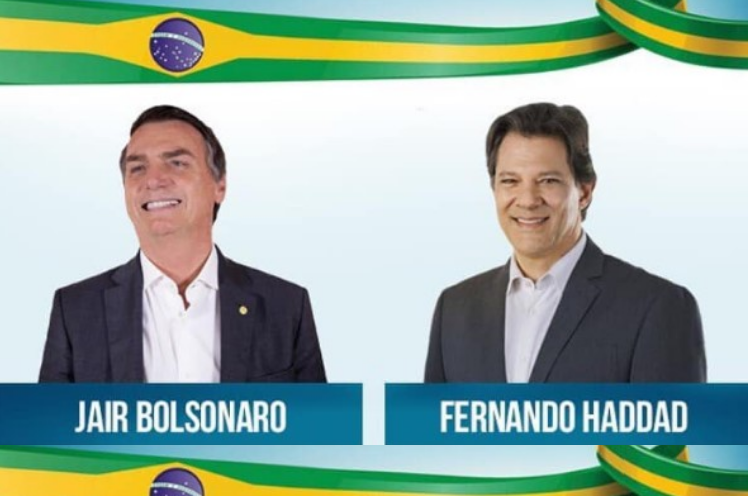 Datafolha meanwhile estimates that no matter who the other candidates would vow to support in the run-off, some 58% of votes would go to Mr. Bolsonaro and the remaining 42% to Mr. Haddad. It will remain a tense next three weeks in Brazil. the globalist's shills are the same in all countries, and their chants all sound the same in all languages…funny that.